As I was looking up at the stars over the ship one evening, I was thinking about the study of space and the 1980’s Teacher in Space program. It’s difficult to believe that as of this past January it has been thirty years since the Space Shuttle Challenger disaster, which took the life of educator Christa McAuliffe and six other astronauts. Christa had been selected to become the first teacher in space, which offers such opportunity to learn and grow. I admire Christa McAuliffe because of this and the fact that she recognized that the study of space offers the opportunity for discovery, innovation and investigation. 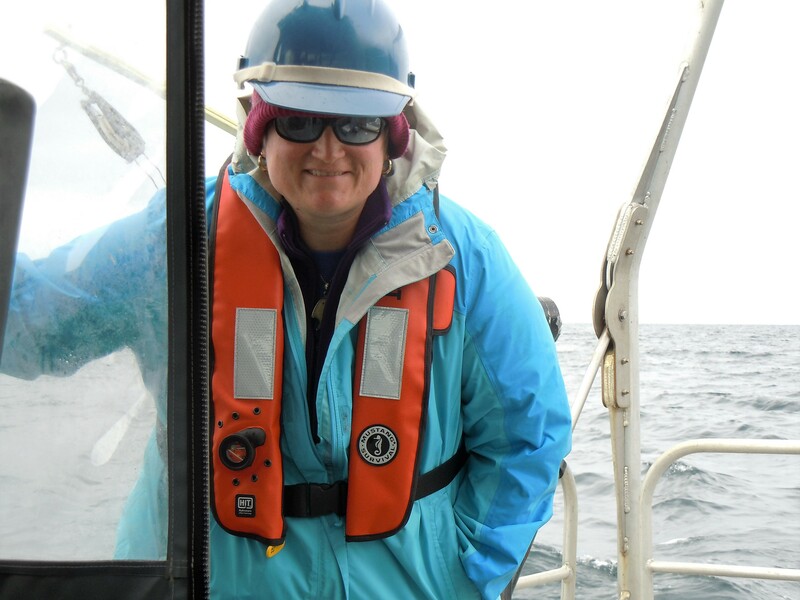 I love being a Teacher at Sea because the ocean is similar to space in that it is largely unexplored and offers the chance to discover, innovate and investigate. In fact, less than 5% of earth’s ocean has been explored even though new technologies have expanded our ability to explore. 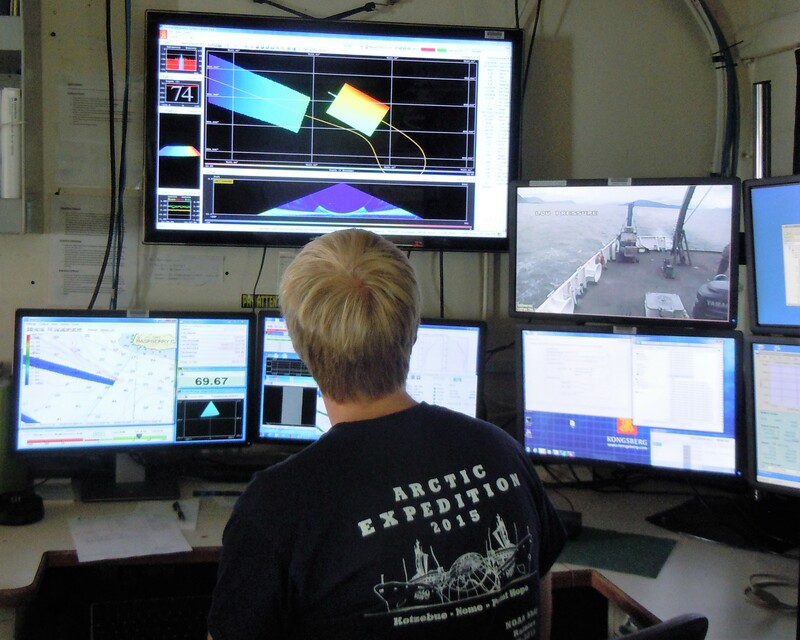 Scientists like those I am working with on the Rainier use a variety of this new technology such as satellites, complex computer programs, and multi beam sonar to explore and carry out their hydrographic work. Over the past week, I have been fortunate to work with these scientists in Uganik Bay and gain a better understanding of how they use these technologies in their work. 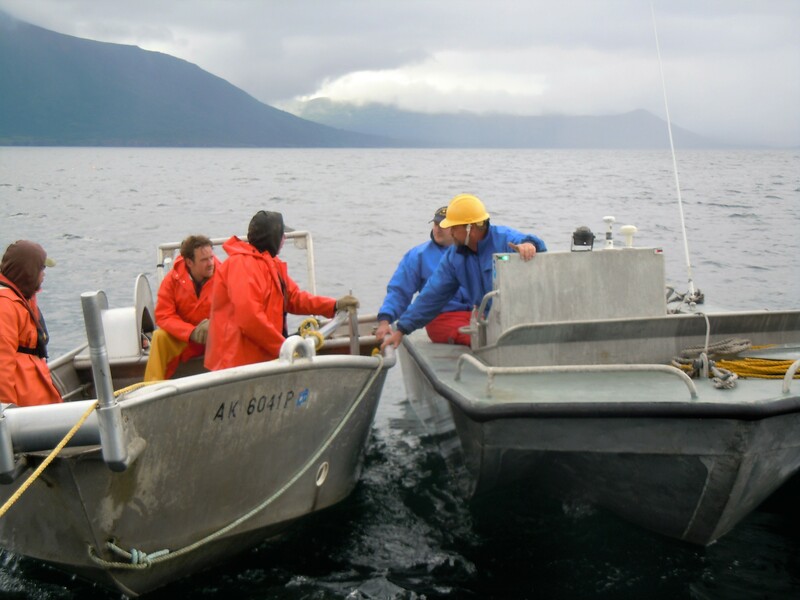 Before the surveying work using the multi beam sonar system can begin, a small crew is sent off the Rainier in a skiff, a shallow flat-bottomed open boat, to complete near shore work. 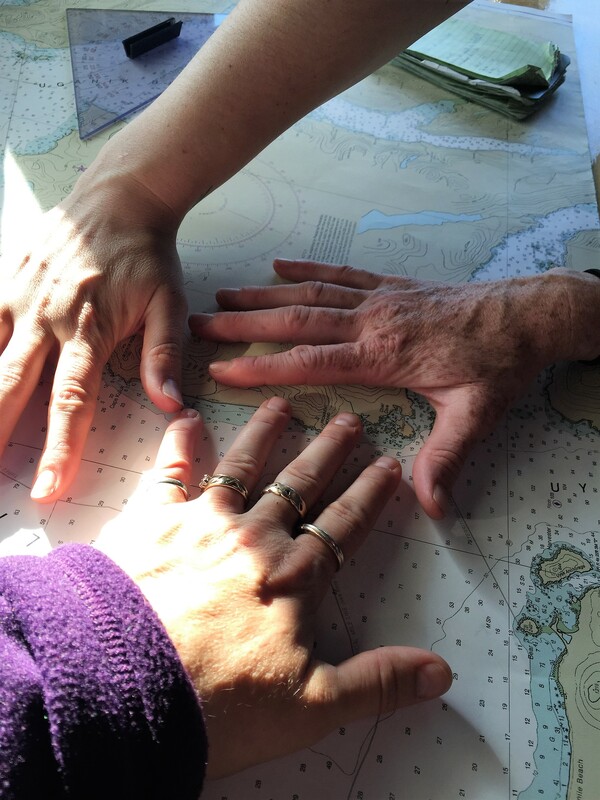 During this work, the crew on the skiff meticulously examines the features of the coastline while comparing what they see to any available charts and other sources of information about the area. 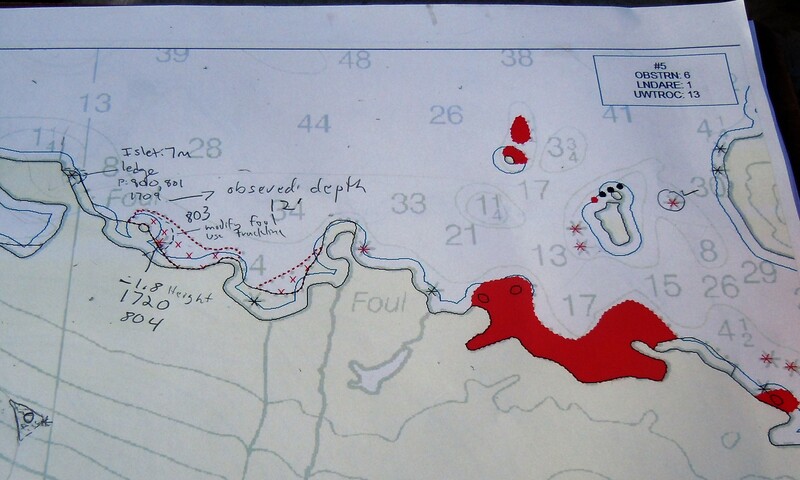 The depth of Uganik Bay was last surveyed and charted in 1908 but the area does have some additional charting of shoreline features documented throughout the years via aerial photography and information shared by local mariners. 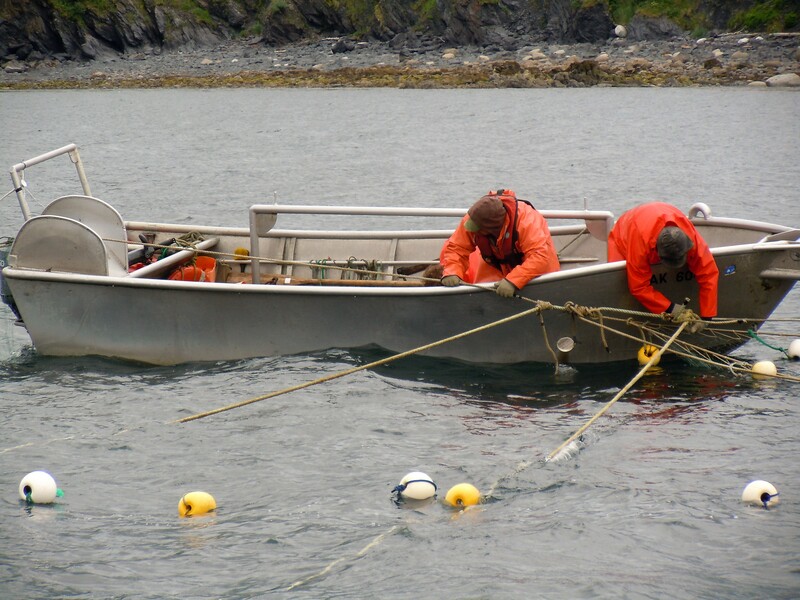 The skiff used for the near shore work is equipped with a GPS (global positioning system) unit and a computer program which continually maps where it travels. 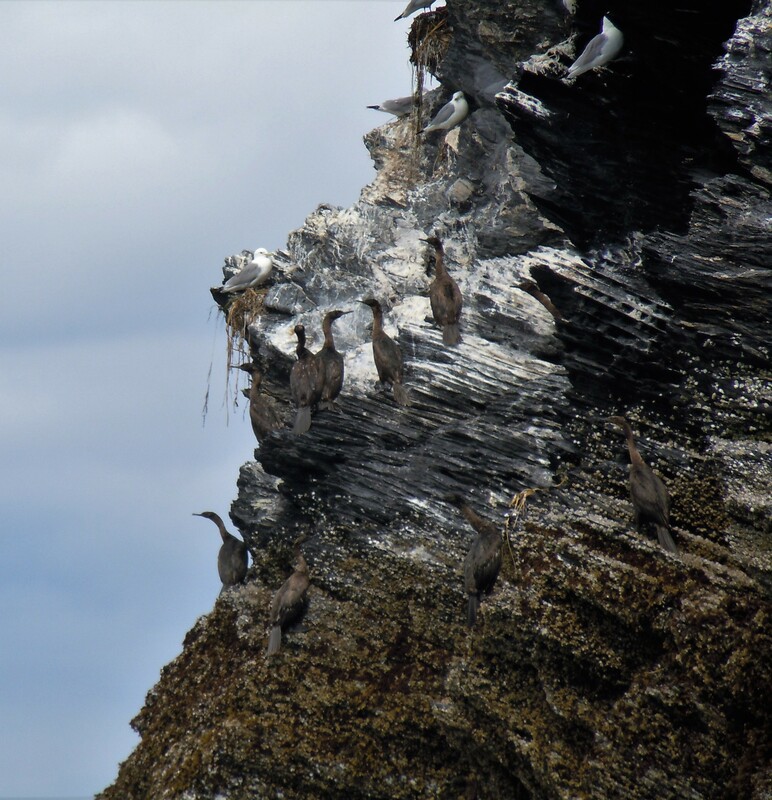 The skiff moves slowly along the shoreline while circling rocks and other features (reefs, islands, kelp beds, fishing gear) in order to accurately determine their size and location. The scientists record all of their findings on a sheet illustrating the area they are working in and enter the revisions into a computer program when they return to the Rainier. These revisions frequently include adding features not previously documented, modifying information on existing features or suggesting possible features to be eliminated when they are not found and verified. Chief Jim Jacobson enters updated information from near shore work documented while on the skiff. 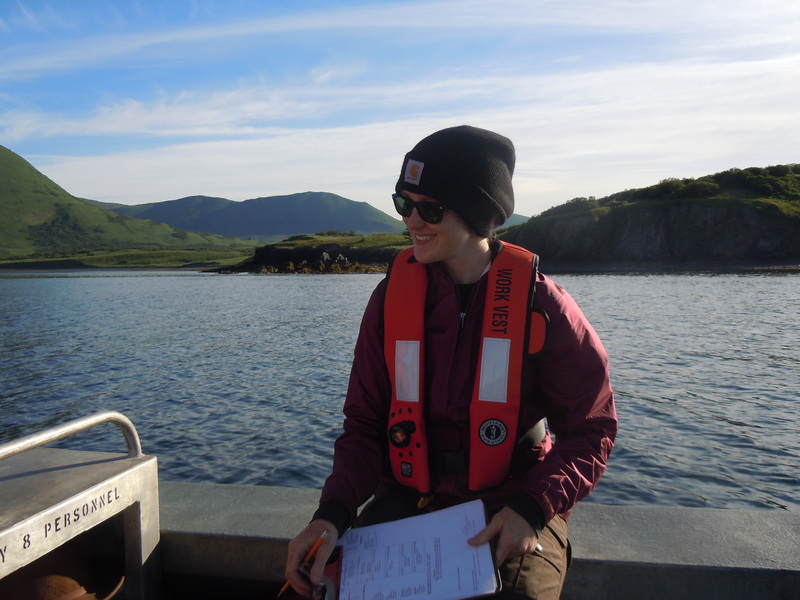 For example, one of the days while I was working with a crew on a skiff, part of our work involved verifying whether or not a series of rocks existed where they had been previously charted. Oddly enough, when looking at the chart the formation of rocks looked like a giant left footprint. This particular feature on the chart, was flagged for us to investigate and verify because each of the rocks that made up “the little toes” seemed to be too equally spaced to be natural features. When we examined the area we found that there was only one rock, “the big toe”, at the top of the formation vs. a total of five. The suggested updates to this feature were supported with the documentation of photographs and measurements. 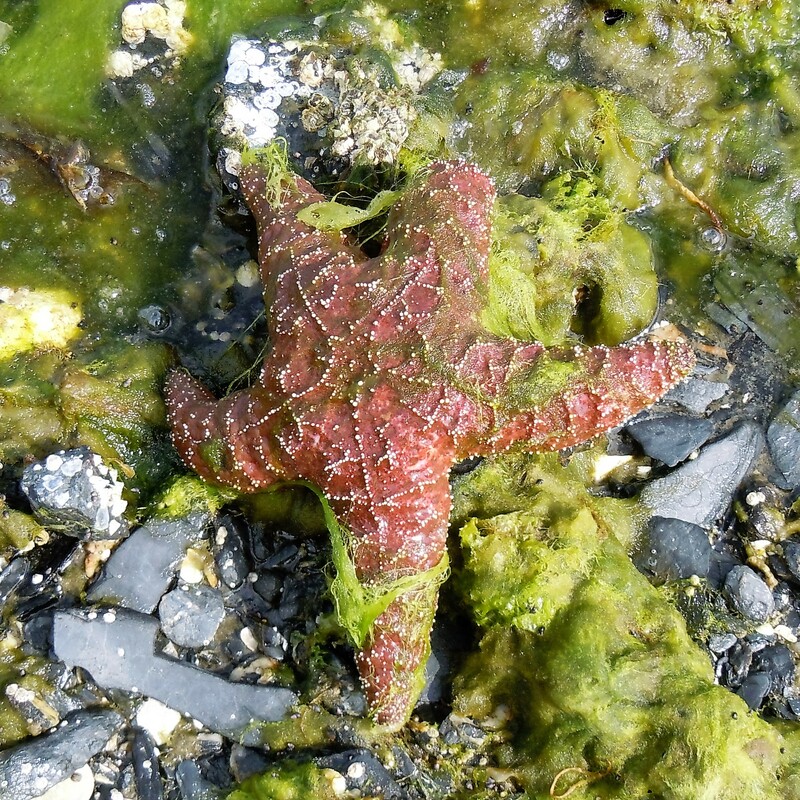 In other words, the scientists suggested that the final revisions completed by NOAA staff in Seattle would include the “amputation” of the four “little toes” from the charts. Sheet used on skiff to document suggested revisions. Notice the “foot” feature? 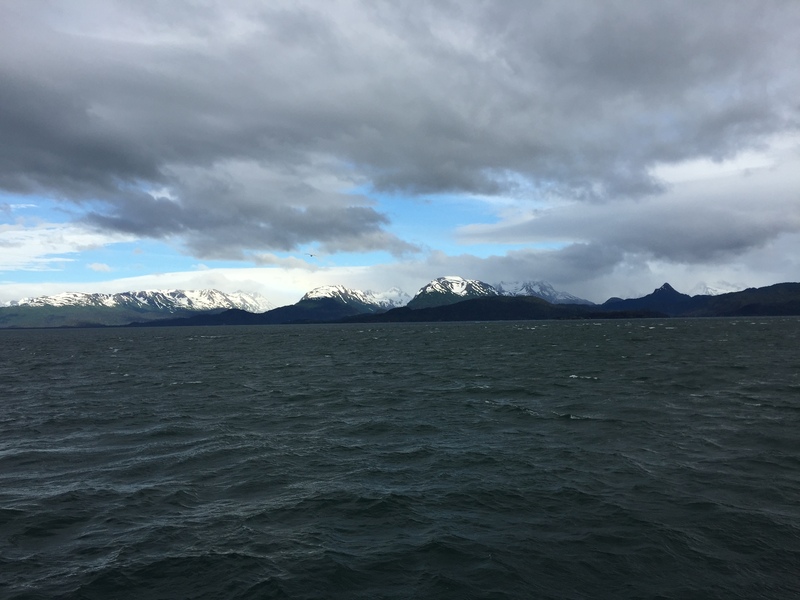 I have really enjoyed chatting with the people on board the Rainier because they have interesting stories to share and are happy to share them. Erin Earley, member of the engine utility crew, was one of those people who graciously gave me some of her time for an interview. 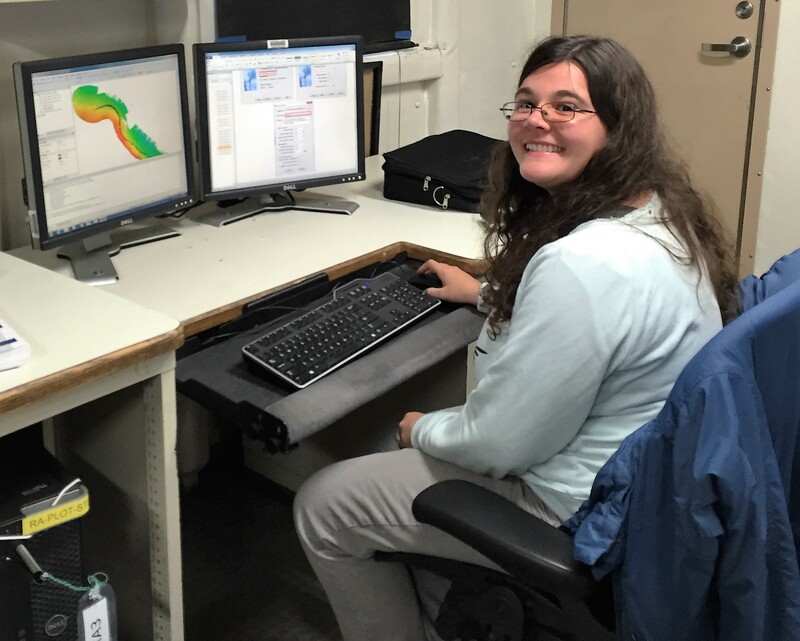 I’m Erin Earley from Sacramento, California and was a social worker prior to working for NOAA (National Oceanic Atmospheric Administration). I enjoy water color painting, creating multi-medium sculptures, and anything to do with designing gardens. And I love dogs, Shelties in particular. As a social worker I had a couple of young adults in the child protection system who wanted to find a different career. When looking at career options for them I came across a maritime program for youth in Sacramento that seemed to meet their needs. So, I went to a parent night to learn more about the program and when I heard about the rate of pay and opportunity to travel I asked if they were considering an option for adults to join the program. They said that they were and I registered for the program and began with the AB (able bodied seaman) program for deck work but after watching the Deadliest Catch I decided that wasn’t for me. So, I decided to complete the engineering program to be qualified for engine room work. The course work included survival work, emergency ship repair work and fire fighting skills. I love my job with NOAA because for the most part I’m working with a small group of people, we all know our duties, and we all help each other out. I enjoy seeing jobs get completed and things getting fixed. And, the most important reason I love my job is that I don’t have to drive to work and dress up. I come from Sacramento, and here I don’t have to wait for traffic coming across town and wait at Starbucks for an hour. On a ship you become a minimalist, you learn what is important and what is not. I love meeting new people, trying new foods and seeing new things! My primary responsibilities at sea include monitoring the oil levels of the equipment, making sure that everything is running properly, reporting to the engineer anything that might be a problem, making sure the bow thruster has proper fluids, and making sure there’s no excess water in any of the places. We’re floating on a huge ocean and we want to make sure none of it’s coming in! What kind of background and/or education do you need to have this job? It would help to go to a maritime school and a lot of major coastal cities have these schools that offer these programs. If you want a four year college education you could go to a maritime academy (San Francisco, New York and Baltimore ) to get a degree in mechanical engineering and then you could work on a ship or on the shore side at a port. If you don’t want to go to a four year college you can still work in engineering but you would have to take certification courses and work your way up. I think for a young person the adventure of working for NOAA is fun but you should always have a plan as far as where you might want to go. Keep your options open! Each of the ocean basins is composed of the sea floor and all of its geological features which vary in size and shape. 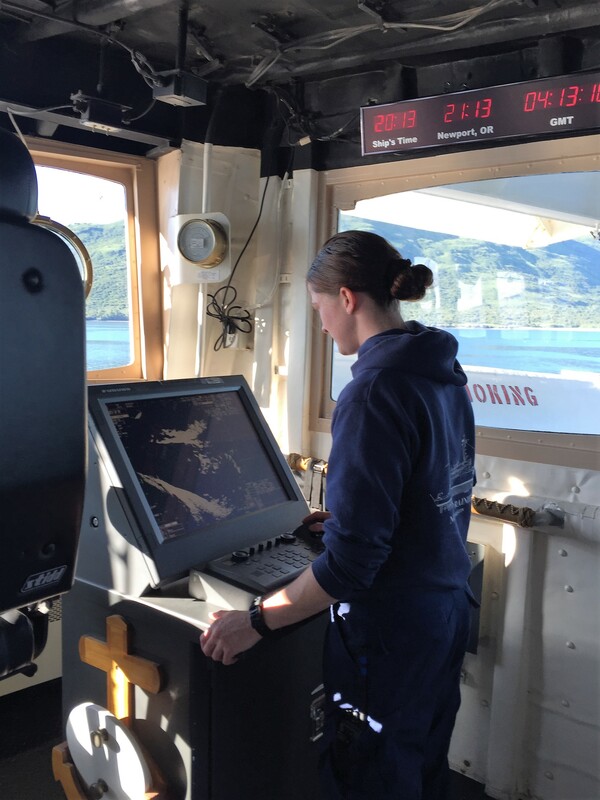 The Rainier will be mapping the features of the sea floor of the Uganik Bay in order to produce detailed charts for use by mariners. 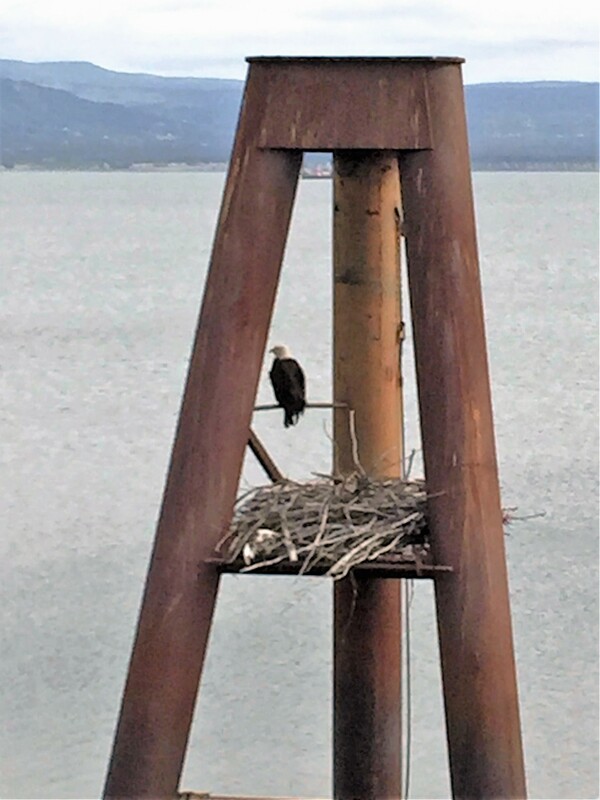 The last survey of Uganik Bay was completed in 1908 when surveyors simply deployed a lead weight on a string over the edge of a boat in order to measure the depth of the water. However, one of the problems with the charts made using the lead line method, is that the lead line was only deployed approximately every 100 meters or more which left large gaps in the data. 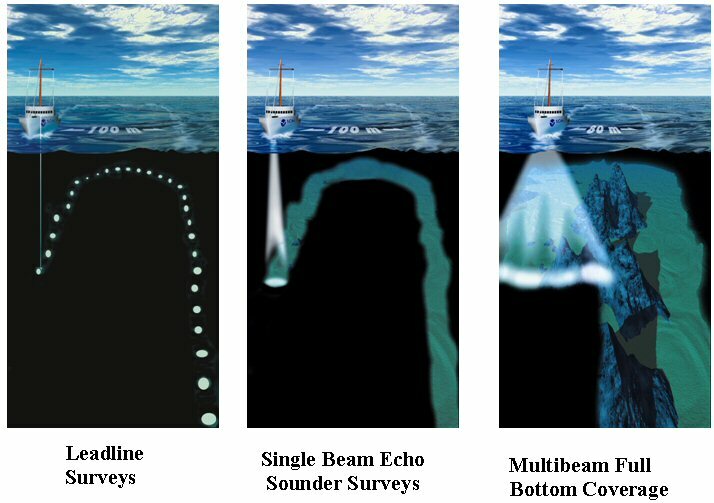 Although not in the Uganik Bay, in the 1930s NOAA began using single beam sonar to measure the distance from a ship’s hull to the sea floor which made surveying faster but still left large gaps in the data. Fast forward from approximately 100 years ago when lead lines were being used for surveying to today and you will find the scientists on the Rainier using something called a multibeam sonar system. A multibeam sonar system sends out sound waves in a fan shape from the bottom of the ship’s hull. 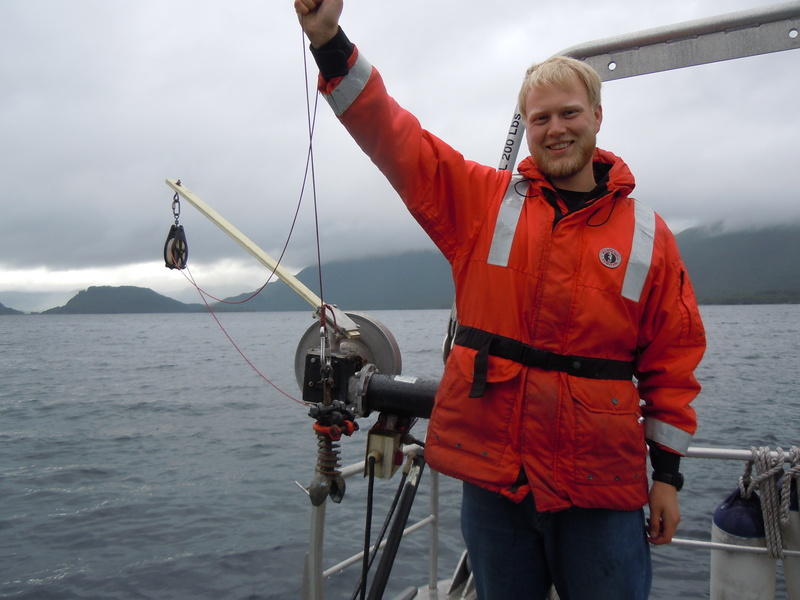 The amount of time it takes for the sound waves to bounce off the seabed and return to a receiver is used to determine water depth. 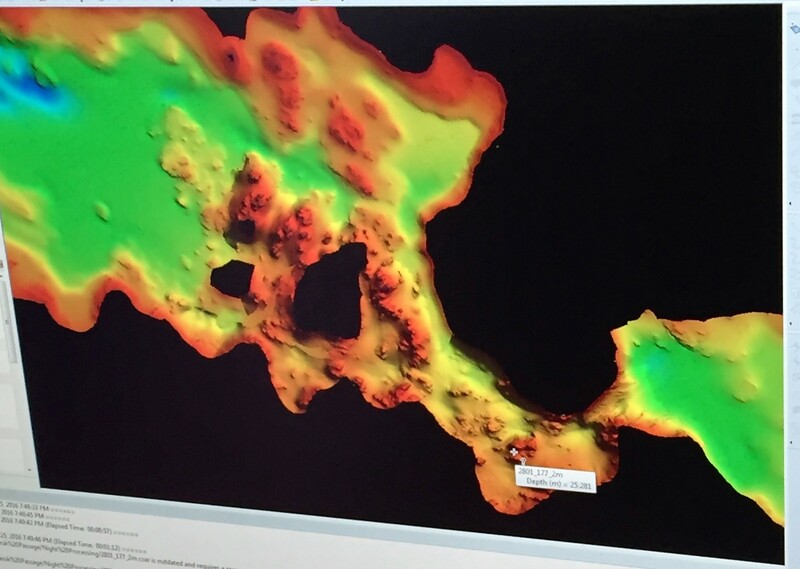 The multibeam sonar will allow our team on the Rainier to map 100% of the ocean’s floor in the survey area that we have been assigned. 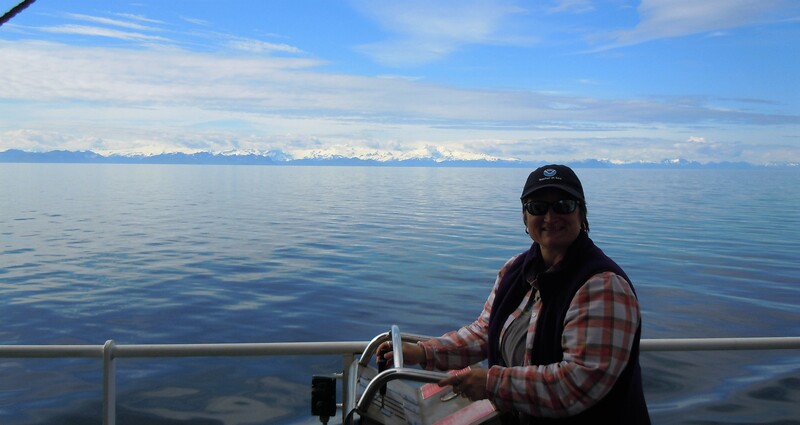 The folks I am working with are some of the most knowledgeable and fascinating people that I have met so far on this voyage and Shelley Devereaux from Virginia is one of those people. 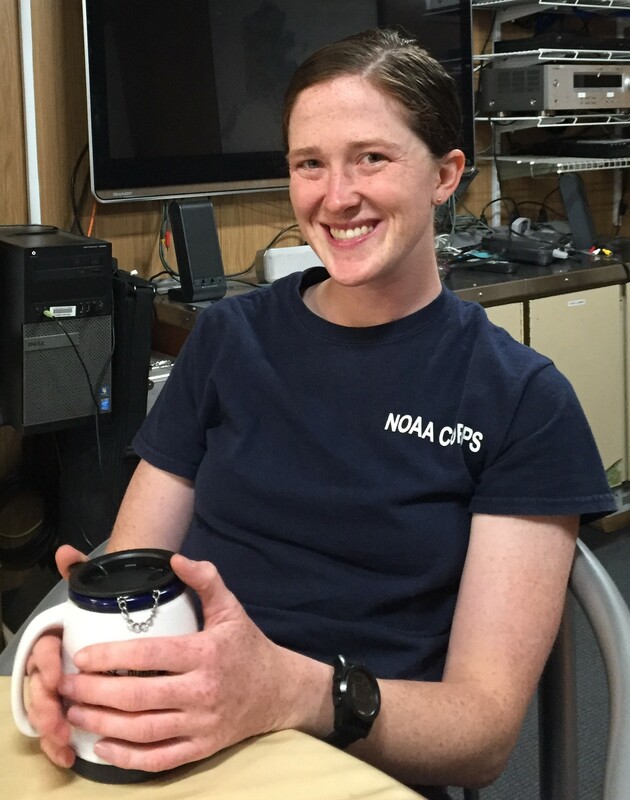 Shelley serves as a junior officer in the NOAA (National Oceanic and Atmospheric Administration) Corps and has been working aboard the Rainier for the past year. The NOAA Commissioned Officer Corps is one of the seven uniformed services of the United States and trains officers to operate ships, fly aircraft, help with research, conduct dive operations, and serve in other staff positions throughout NOAA. Here is what Shelley shared with me when I interviewed her one afternoon. Tell us a little about yourself: I’m originally from the rural mountains of Appalachia and moved to Washington DC after college. I lived in DC for about seven years before I joined the NOAA Corps and while in DC I really enjoyed cycling, hiking, cooking, baking and beer brewing. 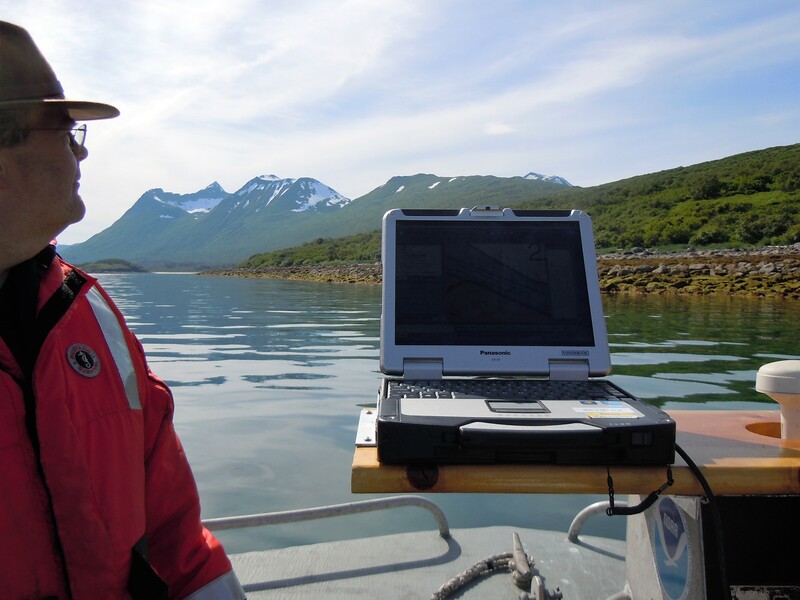 How did you discover NOAA Corps and what do you love most about your job in the NOAA Corps? I went to Washington DC after I received my undergraduate degree in math and worked a lot of different jobs in a lot of different fields. In time, I decided to change careers and went to graduate school for GIS (Geographic Information Systems) because I like the data management side of the degree and the versatility that the degree could offer me. I was working as a GIS analyst when my Uncle met an officer in the NOAA Corps who talked with my Uncle about the NOAA Corps. After that, my Uncle told me about NOAA Corps and the more I found out about NOAA Corps the more I liked it. Especially the hydro side! In the NOAA Corps each of your assignments really develops on your skill base and you get to be involved in a very hands on way. 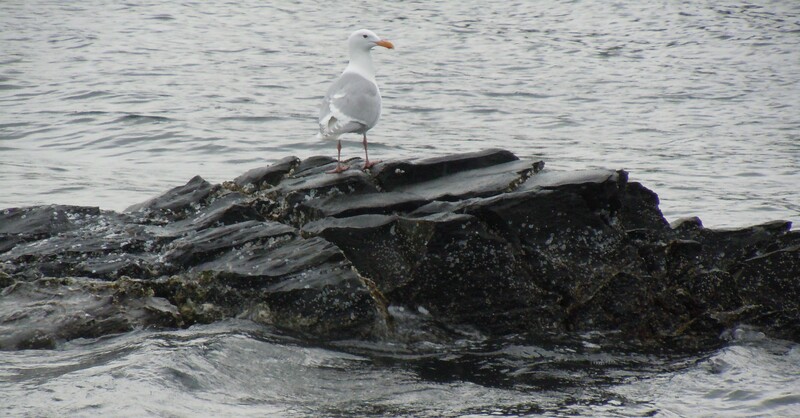 Just this morning I was out on a skiff literally looking to determine what level a rock was in the water. And, later in my career I can serve an operations officer. 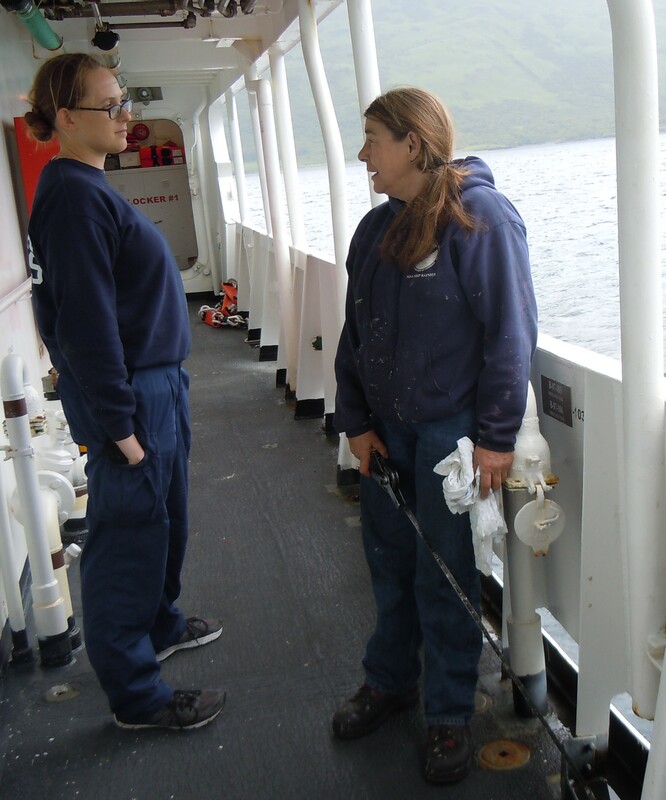 So I loved the fact that I could join the NOAA Corps, be out on ship collecting data while getting my hands dirty (or at least wet! ), and then progress on to other interesting things. 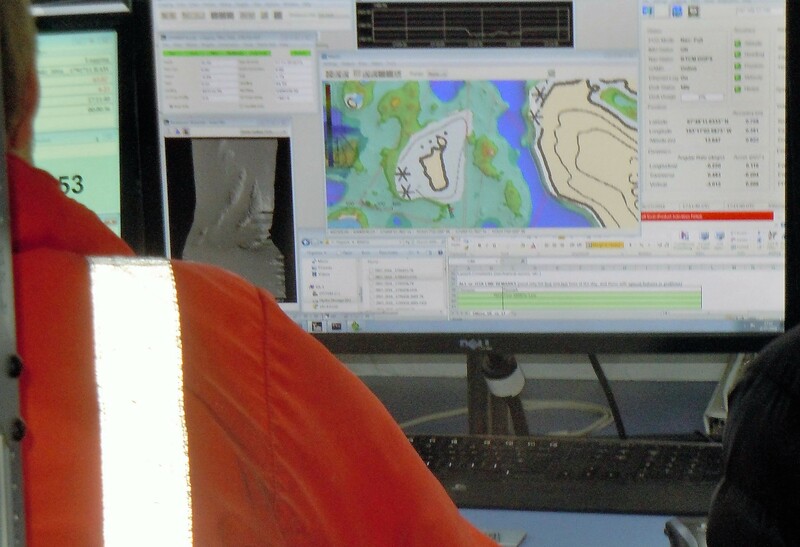 I love getting to be part of all the aspects of ship life and being a surveyor. It’s a wonderful feeling knowing that what we do here has a tangible effect on the community and the public because we are making the water safer for the people who use it. I am an ensign junior officer on a survey ship. Survey ships operate differently than other ships in the NOAA fleet with half of my responsibilities falling on the junior officer side of ship operations which includes driving the ship when we are underway, working towards my officer of the deck certification, working as a medical officer, damage control officer and helping with emergency drills. The other half of what I get to do is the survey side. Right now I am in charge of a small section called a sheets and I am in charge of processing the data from the sheets in a descriptive report about the area surveyed. So, about half science and half ship operations is what I do and that’s a really good mix for me. 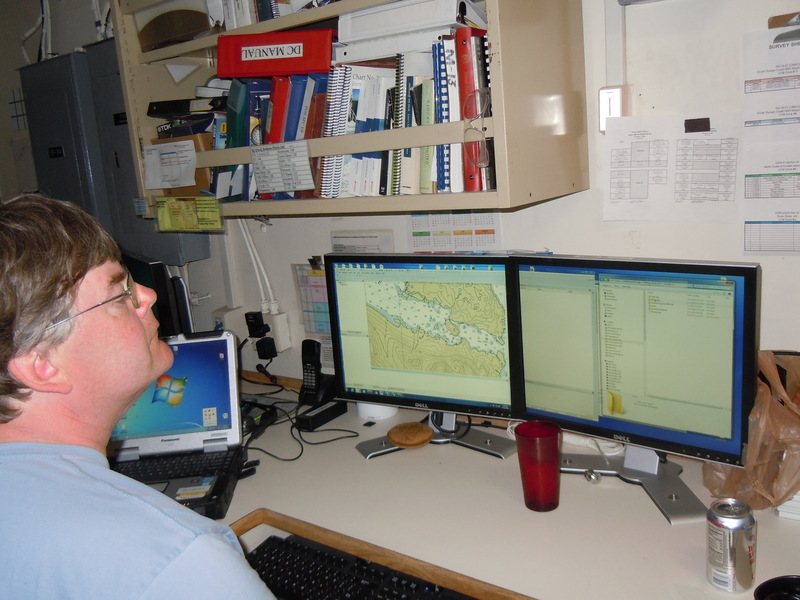 As a junior officer we are very fortunate that we have the opportunity to and are expected to learn the entire science of hydrography. What kind of education do you need to have this job and what advice do you have for young people interested in a career like yours? You need a college degree with a lot of credits in science and/or math. 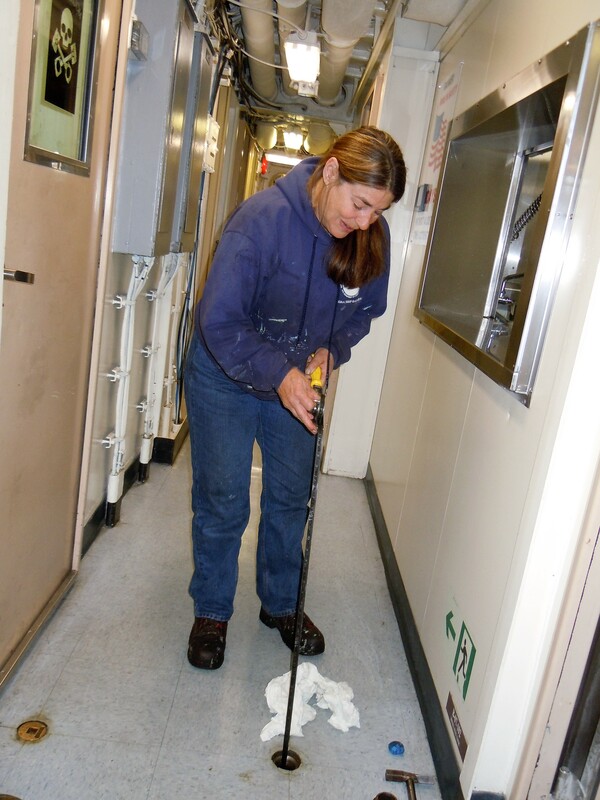 Knowing the science that is happening on the ship is important to help your understanding of the operations on the ship which helps you be a better ship operator. Realize that there are a lot of opportunities in the world that are not always obvious and you need to be aggressive in pursuing them. 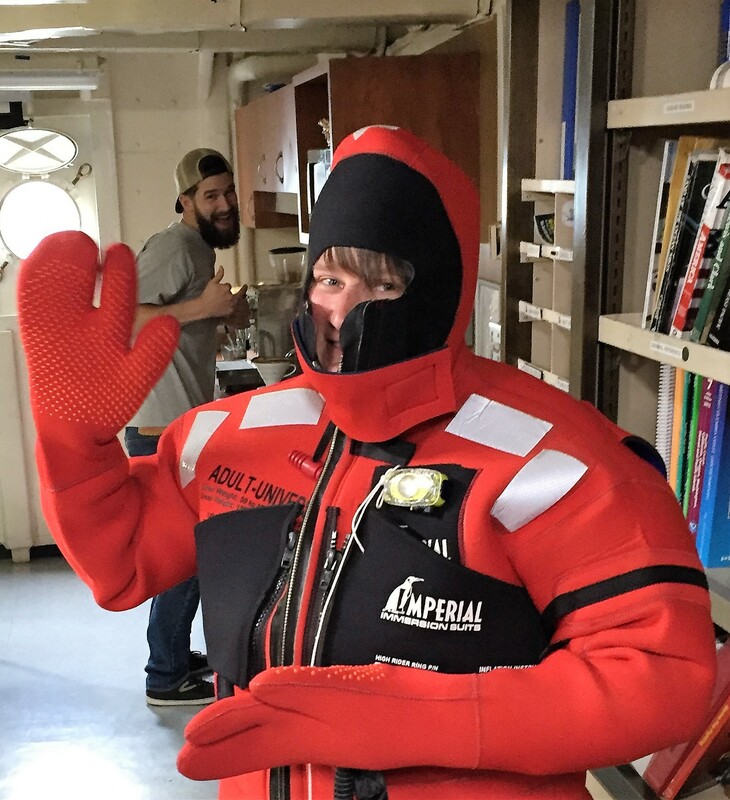 You didn’t think I’d leave out the picture of Teacher at Sea in her “gumby suit” did you? The immersion suit would be worn if we had to abandon ship and wait to be rescued. Teacher at Sea (TAS) Kurth Hi Mom! Happy Solstice! 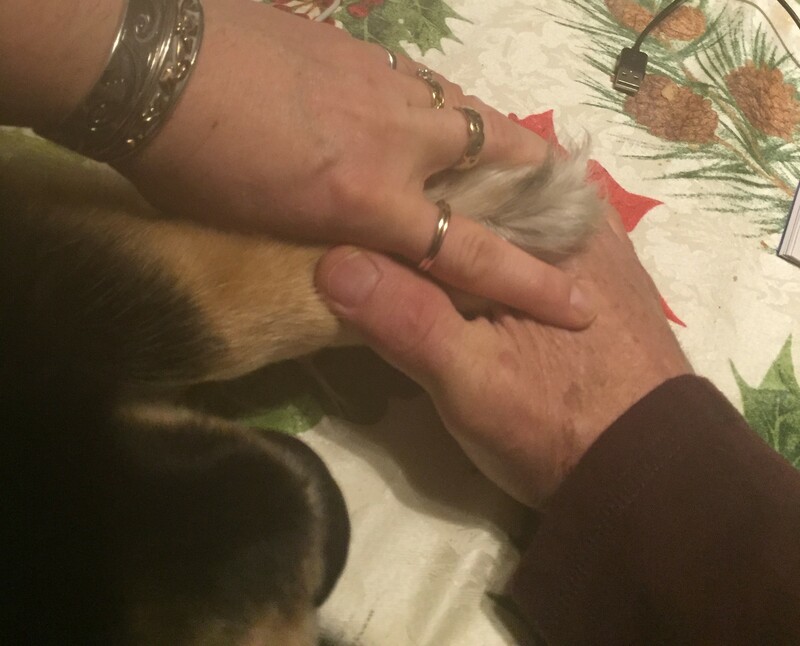 Quirky but fun: For the past six years I have celebrated the solstice by taking a “hand picture” with the folks I am with on the solstice. I was thrilled to be aboard the Rainier for 2016’s summer solstice and include some of the folks that I’m with on the ship in my biannual solstice picture. 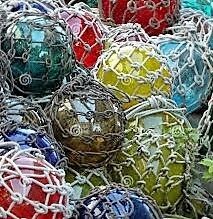 Glass floats or Japanese fishing floats are a popular collectors’ item. The floats were used on Japanese fishing nets and have traveled hundreds and possibly thousands of miles via ocean currents to reach the Alaskan shoreline. The floats come in many colors and sizes and if you’re not lucky enough to find one while beach combing, authentic floats and/or reproductions can be found in gift shops along the Alaskan coast. My name is Lynn Kurth and I teach at Prairie River Middle School located in Merrill, WI. 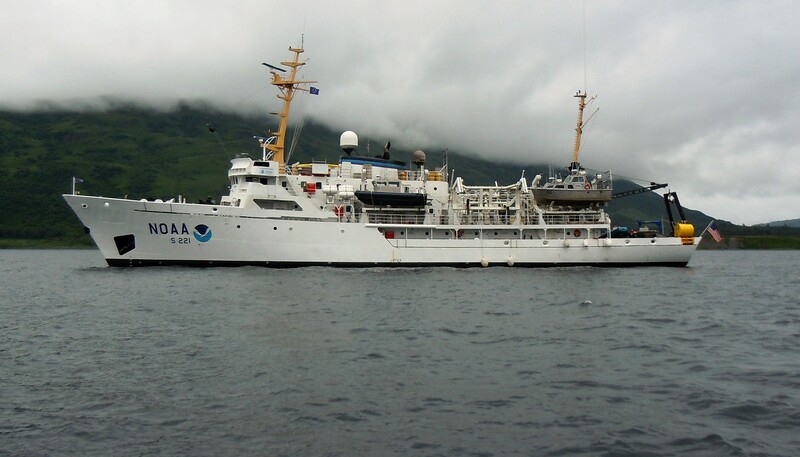 I am honored to have the opportunity to work aboard NOAA Ship Rainier as a Teacher at Sea during the summer solstice. 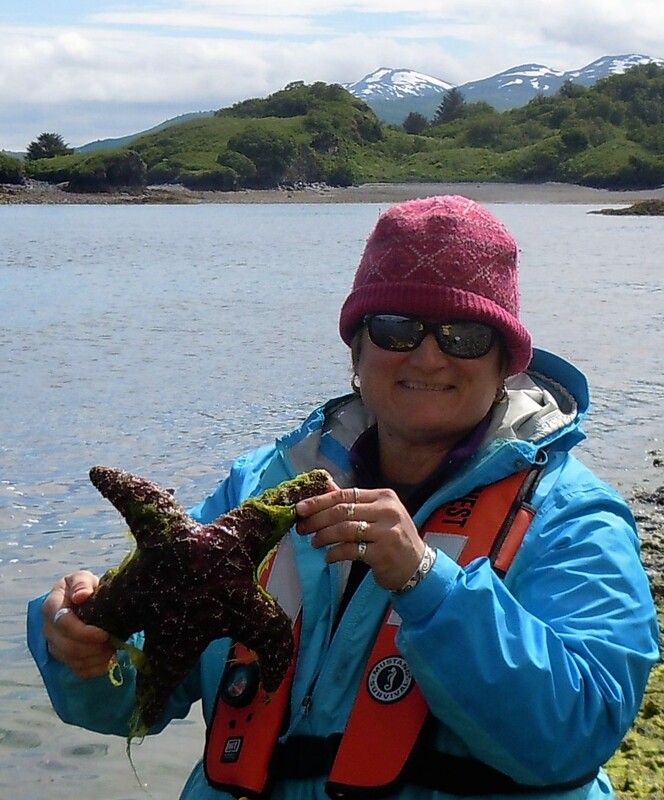 Over the past twenty years of my teaching career I have had some amazing experiences, such as scuba diving in beautiful coral reefs, working aboard research vessels on Lake Superior and the Atlantic, and whitewater canoeing rivers in the United States and abroad. 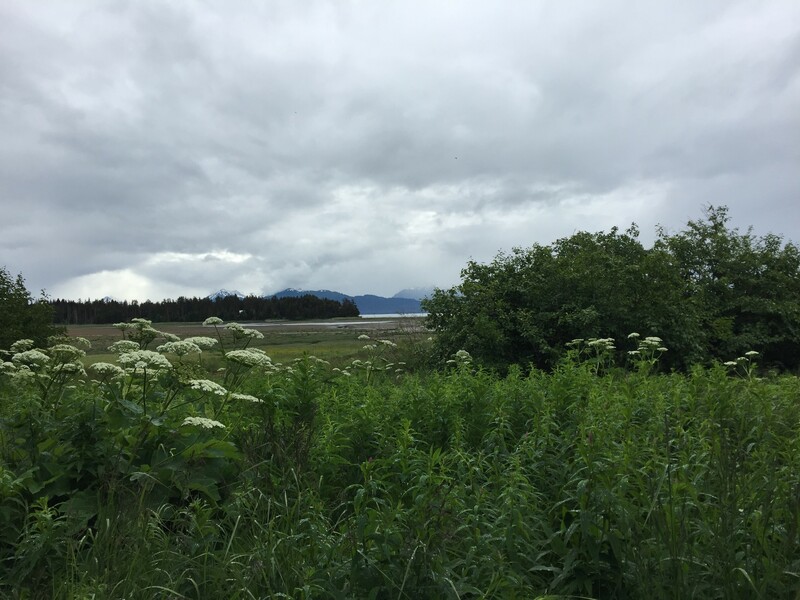 The one thing that all of these experiences have in common is water and because of this I have come to appreciate what a truly important natural resource water is. Because my students are the next generation of caretakers of this important natural resource, I recognize how vital it is to bring water issues into the classroom: Most recently I worked with my 7th and 8th grade middle school students to improve local water quality by installing a school rain garden. During the project students learned about the importance of diverting rain water out of the storm sewer when possible and how to do it in an effective and attractive way. Other projects included the restoration of our riverbank last year and using a Hydrolab to monitor the water quality of the Prairie River, which runs adjacent to our school. 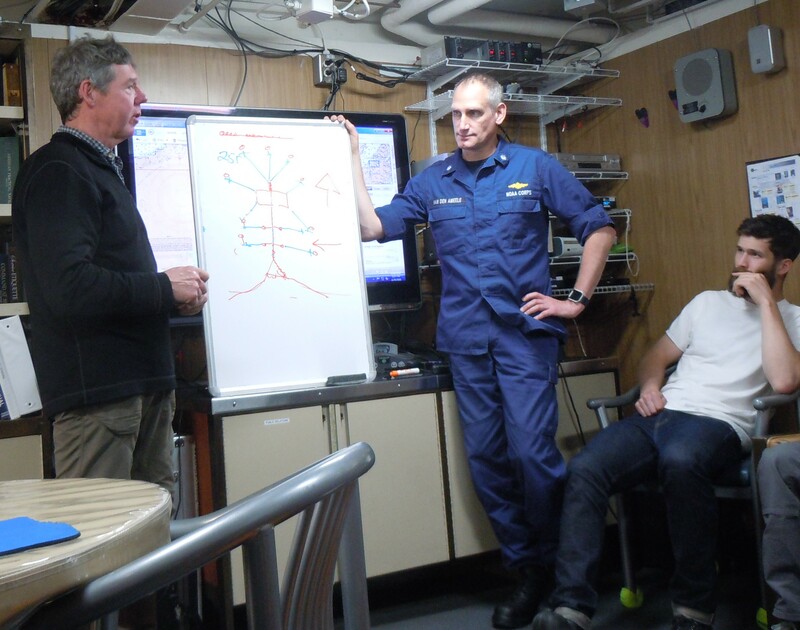 So, sailing aboard NOAA Ship Rainier to learn more about hydrography (the science of surveying and charting bodies of water) seems like a most natural and logical way to move forward. Eighth grade science students jumping for joy during the fall testing of the Prairie River with the Hydrolab. Notice the fellow in waders holding the Hydrolab with great care! 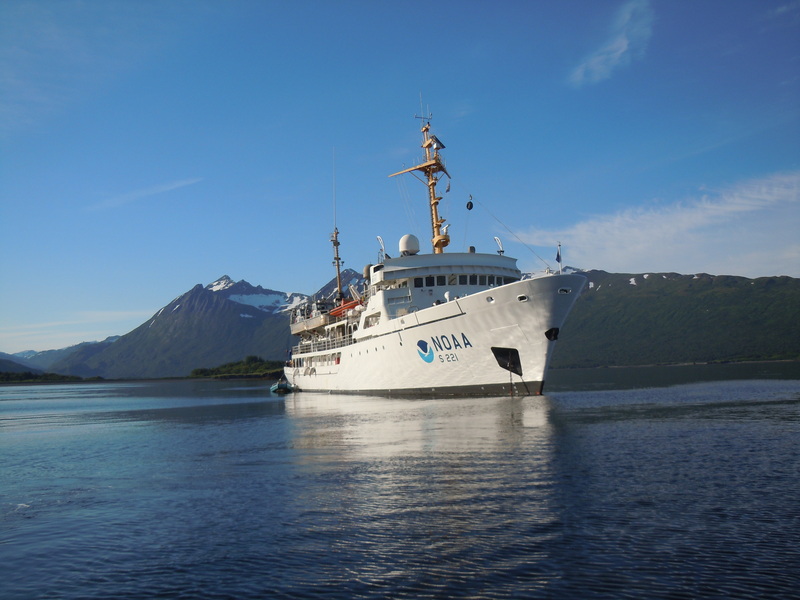 I will be sailing aboard NOAA Ship Rainier from Homer, Alaska, on June 20th. Until then I have a school year to wrap up, a new puppy to train, a project with Wisconsin Sea Grant to work on and packing to get done. There are days I’m a bit nervous about getting everything done but when NOAA Ship Rainier casts off from the pier in Homer I will be 100 percent focused on gathering the knowledge and skills that will enhance my role as an educator of students who are part of the next generation charged with the stewardship of this planet.